This is the second part of my adventures with the Digix! In this blog, I will describe the software and the slightly "hackified" way I got the DigiX and my Beaglebone to talk to one another. If you missed the first section of this, check it out here. Here is a diagram of the breadboard I did up in Fritzing. Note that I have used an Arduino Due instead of the DigiX because there is not yet a DigiX image for Fritzing and the Dues is a similar size and shape. 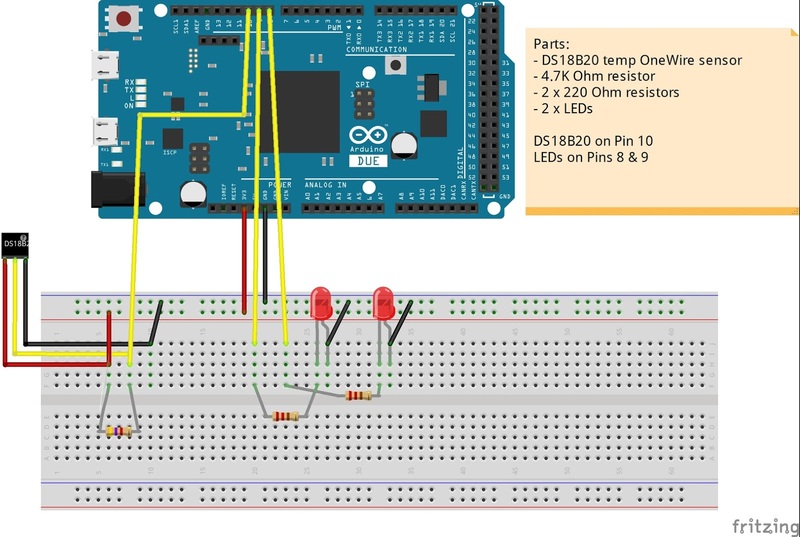 This is very straightforward and there are many good articles on using the DS18B20 OneWire sensor with the Arduino. Here is an excellent article by Simon Tushev. There are also two LEDs. One shows when requests are being processed and the other shows how a digital output on the DigiX can be controlled by the web page off the BeagleBone. The server code for this running on the BeagleBone is a basic Express site modified to use Socket.io and using the Request library to get information from the DigiX. The server then uses Socket.io to push the out to a browser. It also takes input from the browser and sends it back over to the DigiX. make sure you keep this order! I must tattoo that on my forehead so I don't waste time with Socket.io not working!! //If there is an error or the DigiX is unreachable, set the value to an error. When the Socket.io connection is established, this sends over the temerature info from the DS18S20to be displayed on the browser. As well, when commands to turn on or off the LED come over from the browser via Socket.io, the Request library is used to trigger these actions on the DigiX. This reuses the server connected/disconnected status used in the previous project. 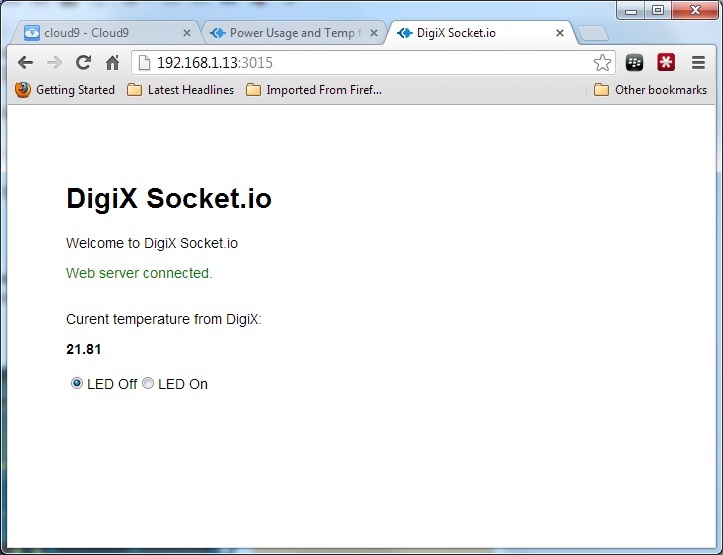 It also uses "socket.emit" to send over to teh server the user selection for the digital output on the DigiX. This is where it maybe gets a bit silly, but it does work. As I explained in my last post, I couldn't figure out how to get Socket.io or even good-old Websockets (which I used four years ago with this project in PHP). I am sure someone with more brains or patience could easily come up with an answer, but I got impatient to get this going, so I came up with this solution. This works as an easy way to get the kind of interaction I wanted for this project, which is just to exchange some simple sensor info in a non-realtime way and test a Server -> Arduino digital output. However, this has some obvious limitations. It would be hard, for instance, to exchange analog information from the server to the Arduino (for instance, to dim an LED using PWM). You could perhaps have the BeagleBone server send over a series of URLs like "http://192.168.1.7/analog789" where "789" is the analog value and the Arduino code parses that out of the request and then sets the PWM value, but I doubt you could do this more than a few times per minute. In other words, this is a nice easy way to get this project working, but I can't see how you could do something like my earlier project where I exchanged realtime movement info over the network (see this project). That's it for now. Next up will be to include this DigiX sensor data in my previous code so I start to have a real "sensor network". Eventually, I want to use the mesh networking off of the DigiX to get sensor data from several other Arduinos (hopefully the tiny DigiSparks if I can make them work). Greetings, this page really ruined the code.. could you clean things up on the digix side? I think I fixed up the line breaks in the DigiX code. Is there something else you are seeing?